Products | Estes Refrigeration, Inc.
Estes’ cold rooms are engineered to specification and extensively tested to meet required performance. Most cold rooms are designed to maintain a +4°C steady state temperature and 50% RH with the ability to set at custom temperature and humidity ranges based upon customer requirements. Our cold rooms can be designed to almost any shape and size. 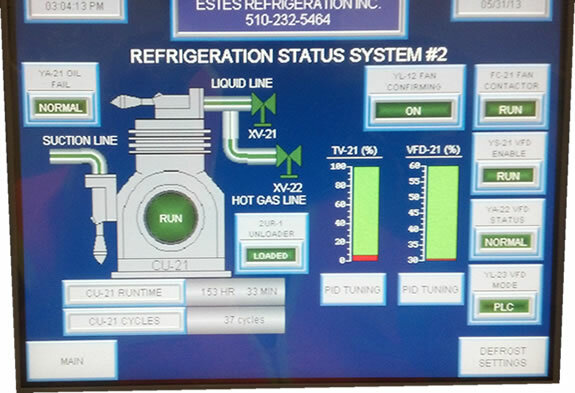 Estes Refrigeration, Inc. is the leader in refrigeration service, engineering, design build, and planned maintenance for industrial, commercial, pharmaceutical, and CO2 refrigeration systems. Our success results from our staff of highly skilled and experienced technicians along with our support staff of engineers, automation engineers, AutoCAD specialists, and a professional office staff. Since our beginning in 1953 Estes has been family owned and operated. Over 62 years later we are pleased to have very diverse customer base, customers from small single employee business, to some of the largest Fortune 500 companies in the world. As an industry leader, Estes has extensive experience building validated classified clean rooms from class 10,000 to class 100,000 to meet even the strictest cGMP specifications including IEST ISO 14644-1 International Standard up to ISO 8 Cleanrooms with minimum airborne particulates and microorganisms. Estes’ warm rooms operate in various ranges of temperature and humidity levels within a single chamber. Standard temperatures from +10°C to over +80°C with humidity levels controlled from less than 1% RH up to 100% across all temperature ranges above freezing. Our temperature and humidity controlled rooms range from -40°C up to +100°C. With special insulated panel construction, we can reach temperatures of up to +125°C. Our control stability is +0.5°C or better. Typical humidity ranges are from less 1% RH to 95% RH with temperatures of -40°C to +100°. Estes can also provide customized desiccant drier systems to achieve and control sub-freezing humidity levels as low as -60°C Dew Point Temperature. Estes’ dry rooms provide advanced design features to achieve low dew point control for your moisture sensitive material processing. Dry rooms are designed to maintain temperatures from +20°C to +40°C, and maintain relative humidities to less than 1% (supply air dew points as low as -60°C). The HMI (Human Machine Interface) is used as an operator control panel instead of an excessive amount of hardware. The HMI brings together all of the displays and functions needed to view real-time controls and monitor your refrigeration and humidity control systems. Provides evidence of third party certification to municipal inspection authorities and the purchaser of the panel. Estes closely follows the construction practices outlined in UL’s standard for Industrial Control Panels, UL 508A. Our UL file number is E326680. Estes engineers and manufactures custom chillers, from comfort cooling to low temperature ice production. Our chillers are dependable, quiet, and high performance with the most sophisticated controls in the industry.